You may of noticed by now that I love to cook with cauliflower!! For this recipe I have combined Indian curry flavours to create a vibrant and flavourful dish by using turmeric and fennel. The dipping sauce for this roast cauliflower is just insanely good. I picked up the idea from Janine of the Siúcra Shack. Janine is a brilliant creative and teacher who I have assisted in the kitchen during her pop-up dinners at The Green Sheep in Thurles (you need to taste the falafel from here too!!). Basically the sauce is a curry mayonnaise that you would happily eat straight off the spoon. It also works well with chicken, chips and this salad so enjoy!! My Dad also likes to stir it through rice and peas….don’t ask but he likes it! If you don’t have a pomegranate or can’t get your hands on one don’t despair!! Use dried cranberries, raisins or simply replace completely with a handful of seeds. Preheat an oven to 200°C/180°C fan/400°F and melt the coconut oil in a large roasting tray in the oven. Once the coconut oil has melted, remove from the oven and mix through the turmeric, fennel and cauliflower until well coated. Roast in the oven for 25-30 minutes or until cooked through. Remove and set aside to cool. Make the curry dipping sauce by combining the mayonnaise or yoghurt with the curry powder and lemon juice until smooth. 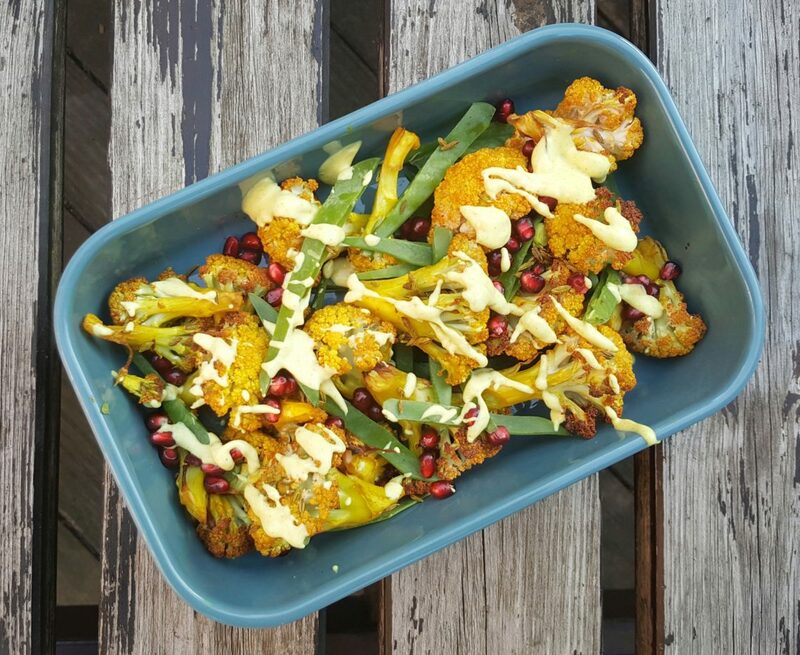 To serve: place the cauliflower in a large dish, scatter over the sliced mangetout, pomegranate seeds and drizzle over the dipping sauce.